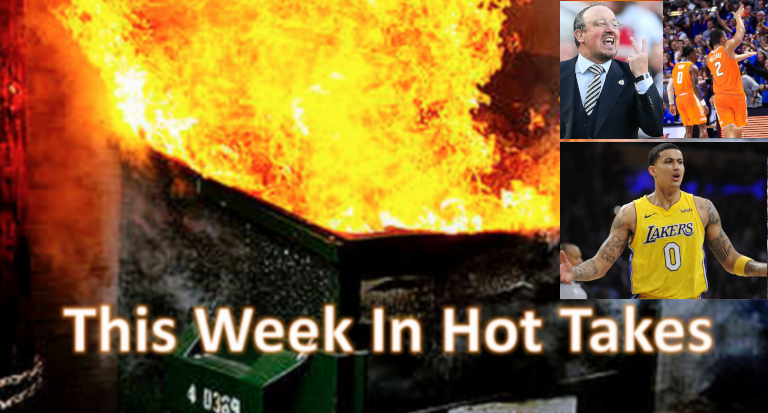 This Week In Hot Takes: Mark Readings on "how you breed for the NBA"
Welcome back to This Week In Hot Takes! This time, we’re breaking down the hottest sports takes over the span of Jan. 11-17. They had a deal. The A’s agreed to let him play another year of football. Now he’s using it against them. I get leverage, but this just doesn’t feel right. Besides, wasn’t it about what he loved more? Now it’s who pays more guaranteed? I love Kyler though… do your thing. It’s somewhat understandable why some aren’t thrilled with Murray for asking for more money to turn down the NFL draft, but it’s notable that the situation has changed dramatically since the A’s drafted him last summer. At that point, many weren’t high on Murray’s NFL draft stock, especially given his listed height of 5’10” (even if that’s becoming increasingly more irrelevant in today’s game, there are still plenty of “But he’s short!” pundits), and he may well have been a later-round pick. But his Heisman Trophy-winning campaign this year has dramatically boosted his likely draft position, which means that he would be turning down a lot of money if he avoided the NFL draft. It doesn’t seem too unreasonable for Murray to ask for more from the A’s to choose them now that he has more leverage. And it’s notable that (as per Passan and others) both the A’s and MLB tried to offer him more to get him to stick with baseball alone. It’s also notable that teams change their mind on players all the time, especially in the NFL where contracts aren’t fully guaranteed, but also in MLB where top players who get injured before the end of their rookie deals don’t get the lucrative extensions they were promised. And yet, teams are criticized much less for doing so. But everyone has to dump on players trying to use the few levers they have to maximize their own earnings. When a team uses a celebration of their own repeatedly, it should be far from unexpected that opponents will reference it when that team loses. And yet, many pundits seem to have a huge problem with this for some reason. (See also Texas and “Horns Down.”) Sports often involve emotion and exuberance, and that’s part of the fun for many, and many fans enjoy watching individual or team celebrations, especially those trolling the opponent. It’s unclear why pundits like Katz feel the need to constantly tsk-tsk about moments like this. 3. Richard Keys says Rafa Benitez should spend his own money on buying players for Newcastle: Many have criticized Newcastle United owner Mike Ashley for only spending limited amounts of money on new players while also taking back money he’d loaned the club, but some have tried to jump to his defense. That included former player and current BT Sport analyst Rio Ferdinand, and that led to an even hotter take from Keys. Keys, an anchor for beIN sports, argued that if manager Rafa Benitez thinks the club doesn’t have enough money to buy the players he wants, he should…chip in his own money? I'm going to guess that you don't. Because you are an employee. Now imagine BeIn refused to pay for good guests and allowed the studios to fall into disrepair, making a) your job harder and b) you look foolish, and think how you would feel. Hey presto. He continued: “I don’t know why politicians don’t do what the country wants, if I’m honest. They had a referendum and now we see different politicians and everyone else trying to put their foot in it … Why did we have a referendum in the first bloody place? “To hell with the rest of the world” is quite a stance for a manager of a club owned by Malaysian businessman Vincent Tan, one that currently has players from 13 countries on its first-team roster. And a good way to increase negative awareness of yourself is to tweet out stupid things. Okay, then. Good job deciding to give this guy a checkmark, Twitter.